Well folks, the news has dropped, and so has my jaw! This release looks huge, and makes the 7th edition ruleset look particularly awful by comparison! I mean, right off the bat there’s just so much stuff! I’ve not played Shadespire, but from all accounts it’s pretty good. Using the same rules designer to come up with this game seems like it’s a sure bet for success, at any rate. The article linked above talks about what will make the game so good, such as the squad customisation stuff, and from the sounds of it, we should be in for a really great addition to the 40k universe. The way that the game is going to be supported, with individual Kill Teams available with their own bits of terrain, as well as terrain bundles that come with the game mats to play on, sounds like it’s almost akin to a boardgame than anything else, and I guess that is the overriding impression I get from the launch article, that they’re heavily targeting the boardgame audience rather than making just a different way to play with your existing 40k collection. 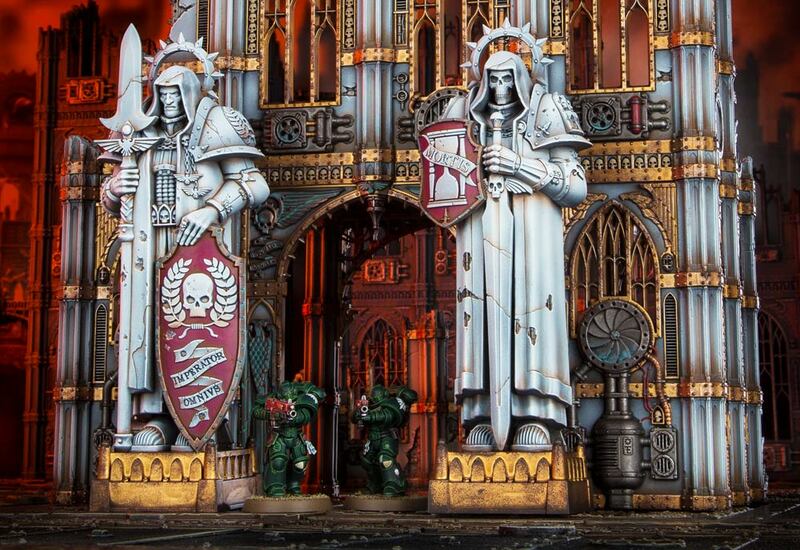 The scenery does look incredible, and I really want to get that Basilicanum right now, even though my painting backlog is insane! It’s not all fantastic though, as there is something giving me a little pause here. 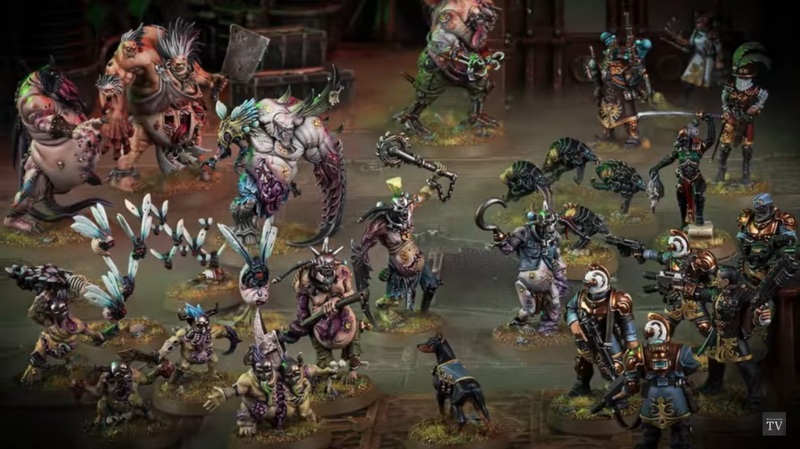 The game is described as the successor to Shadow War: Armageddon, and the article ends with a look at the different factions that will receive rules support, saying that “each of these factions uses a specially chosen pool of units, designed to represent the kind of forces you’d find in a kill team”. While I realise that balance is important for these sorts of small scale games, one of the things I really hated about SWA was the fact that I was so severely forced into playing with a narrow pool of units if I wanted to play the game – sure, I want to play Tau, so I have to play with Pathfinders and cannot make a team out of Fire Warriors or just two/three Crisis Suits. I might want to try out Dark Eldar, but cannot make a Coven team, or a Kabalite team, but instead must use only Wyches for the core of the squad. It just feels so incredibly cramped that I found myself without a whole lot of interest in playing it as time went on. 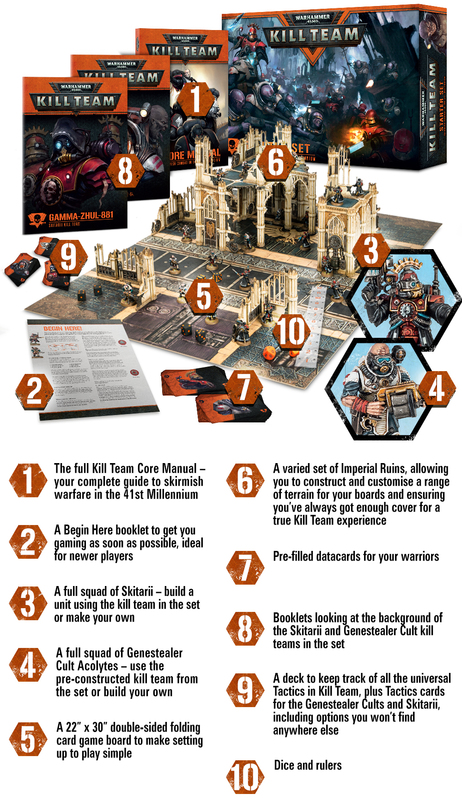 I hope that Kill Team is much broader, and uses a similar sort of idea to the last iteration, and instead of really prescribing the models we can and can’t use, it will allow for much more cherry-picking of favourite unit types. While not mentioned in the article, the FAQ they have posted alongside all of this news does specifically state that the recently-leaked Rogue Trader game is actually an expansion to this game system, which sounds like it should be a fantastic new games line for the company. Delving into corners of the 40k universe that the main tabletop wargame doesn’t otherwise allow for conjures up all manner of goodness to me – principally, Arbites! Who knows what awesome stuff they could bring out?! It’s very exciting, and really cool to see something done to this extent with the skirmish game. I’m really looking forward to getting my hands on the book (maybe the box set itself), and maybe getting some games in with a couple of the other skirmish fans at my local store! Got to say I am super excited for this myself, can’t wait to field my Death Guard for it. I’m really looking forward to trying out a lot of the smaller forces that I’ve collected over the years, particularly Thousand Sons and Death Guard, yeah! Hopefully it’ll be really good!! Yeah provides a good playground for smaller forces that don’t make the cut for the full game, should be a great time once it comes out! Next Next post: Summer Painting Updates!